Named for the eldest man of the household, who was usually the breadwinner, the Grandfather Shirt is an Irish tradition. Generously cut shirt has a banded collar, button placket, jetted breast pocket, button cuffs, and shirttail hem. 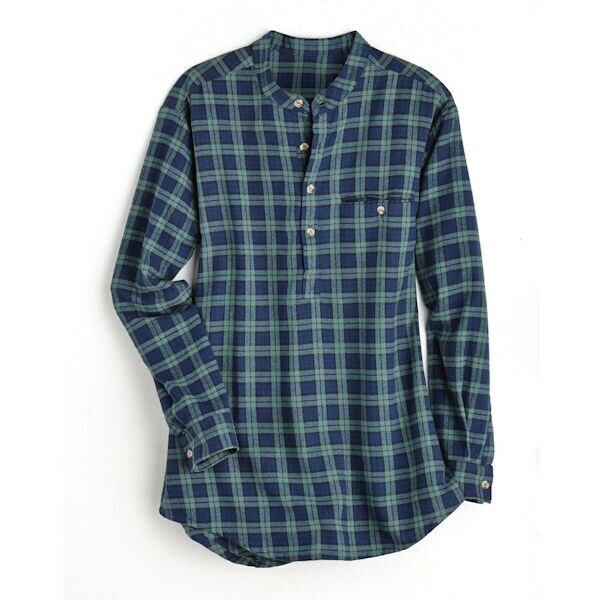 Nightshirt has a relaxed fit, sleeve plackets (so he can roll the cuffs), and shirttail hem. Both are 100% cotton, brushed on both sides. The more it's washed, the softer it gets. Machine wash. Made in the village of Inchigeela, County Cork, Ireland. Men's sizes M-XXL. Shirt also in 3XL.